As a beauty editor, I come across countless skincare products promising all sorts of magic. Some have some truth to them, and others are a little more fluff. So it isn’t very often that I’m introduced to a skincare line that leaves me super impressed right from the start! 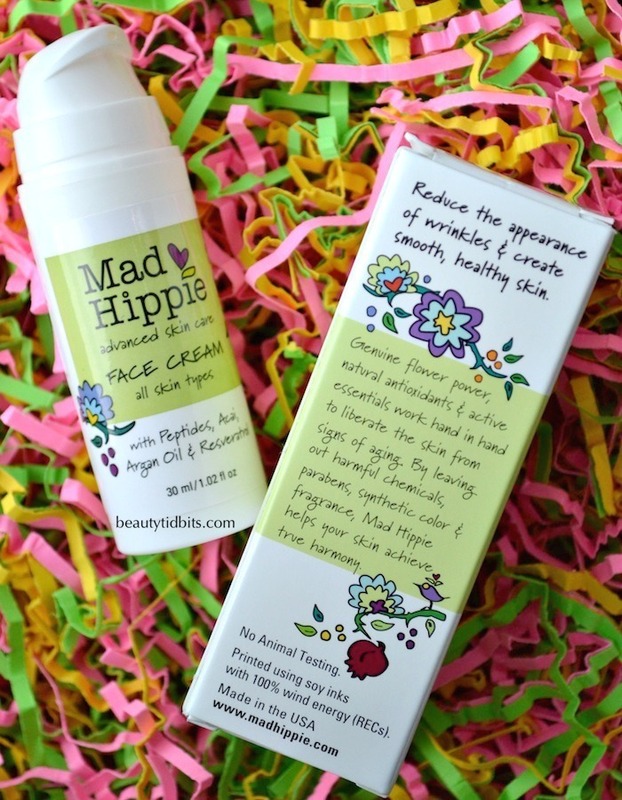 Mad Hippie skincare is definitely one of them…and the best part is that it’s an all-natural line that’s also budget-friendly! Formulated without any harsh chemicals or synthetic additives, Mad Hippie is an advanced skin care range packed with all natural anti-aging actives that compliment one another & work in synergy to reduce skin discoloration & wrinkles. Their philosophy: More Actives. More Results. All Mad Hippie products are made in the USA, never tested on animals and are packaged in BPA-free, recycled and fully recyclable bottles. Mad Hippe Face Cream comes packaged in a recyclable bottle with an airless pump dispenser so it’s never exposed to excess oxygen or un-sanitized fingers dipping into it and thus no contamination or degradation. The formula has a really nice, lightweight texture that absorbs super quickly. Since there is no SPF in this face cream, I have been using it only at night after the Mad Hippe Vitamin C serum (review coming soon!) You can also use this light moisturizer under your makeup (perfect as a hydrating primer!) or sunscreen during daytime….it’s great for daily use for all skin types. However, I already use an SPF-infused moisturizer in my morning routine so I prefer to use this product at night. I love the way it leaves my skin feeling so smooth and hydrated without any signs of greasiness or shine. It has a very light and pleasant floral scent that dissipates soon after application. This cream really does a great job of moisturizing my normal to dry, but acne-prone skin and never once made me break out. This one is definitely staying in my rotation! If you’re looking for an affordable, all natural anti-aging face cream with an impressive array of great-for-your-skin ingredients, Mad Hippie Face Cream ($25.99) is the perfect choice! The formula is suitable for all skin types including those with sensitve skin. Sounds great! Love the cute packaging.. I’m a sucker for good packaging! Kissandmakeup Then you def need to try this line 😉 I am sure you will like it…good stuff!